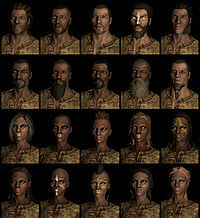 A montage of preset Redguard faces available in Skyrim. Redguards, for the first time, have received bonuses to not only combat skills, but magic skills. They can easily become battlemages or spellswords early on with a strong bonus to one-handed weapons, as well as bonuses to destruction and alteration. Players can also take advantage of the Redguard's bonus to archery, making Redguards one of the most versatile races in the game. Their Adrenaline Rush power allows the player to use all-out power attacks in succession without draining their Stamina, helping them survive at earlier levels through incredible offense against tougher opponents.